I really like the Everlast patch. It is quite detailed. The discus thrower is cool! Reminds me of the Wright & Ditson glove patch with the tennis player. Have to see if I can find that one. Wright & Ditson Co. were really into tennis racket manufacturing. The Stall & Dean patch is on a Stanky Special Model 8021. It's listed in the Glove Catalog Source Book in 1957. Hey Mike, here is the Tennis Player tag on my Babe Ruth glove. That is the one! I love that patch, being a tennis player myself. 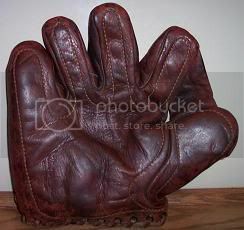 Was your Babe Ruth glove made after Reach absorbed Wright & Ditson Co. ? My favorite patch, I have only ever seen this one example. Neumann Newvine of Utica, New York. Yes, after the merger. I always liked the FOLEPRO tag. This patch is from a circa 1915 W&D basemitt when W&D were seperate from Reach. Funny the same patch would be used in the 1930's after the merger. I owned a glove with the Forrest products patch. Love the pine trees! Ah, mother nature. Reminds me of a glove I had, possibly a Hurricane, with palm trees on the cloth patch. Wish I could find it again. Interesting topic for a lot of reasons. Love the old patches. I don't have any that haven't been posted already but I'm loving all the new stuff. Also, the Reach, Wright & Ditson semantics is interesting. Reach was bought by A.G. Spalding in 1889, W&D in 1891. I've never heard of a sale of those brands from Spalding so any merger would have been internal and likely just for marketing. Victor Sporting Goods merged with W&D in 1918. Then they were all under the umbrella of Spalding. Interesting. They were one huge company, maybe the Microsoft of their day. I read that Charles Whitney, the founder of Victor Sporting Goods complained bitterly about the price competition from Spalding and even took them to court. Eventually he must have felt, if you can't beat-em, join-em. There were really only a handful of sporting goods companies circa 1920 that weren't under Spalding's umbrella, or at least purchasing through Spalding as a private label manufacturer. Ken-Wel, D&M, and Goldsmith. I'm sure there are others, certainly smaller companies, but those three big names come to mind. It's amazing how much Spalding bought up. I picked up this mitt on ebay years ago basically because it looked cool. The seller had very little information listed. It was a circa 1930 buckle web basemitt with a real squat design.There was no stamping left in the pocket to identify the mitt. I had never heard of the "Sainz" brand and did a little research. J.M. Sainz Athletic Goods was out of St. Louis and supplied the Cardinals with some of their uniforms in the 1930's. It was the same company that produced this mitt. I couldn't find much more about J.M. Sainz. They must have been a fairly small company. I really loved the patch and is one of my favorite's even though the mitt wasn't bought with that in mind. Last edited by mikesglove on August 25th, 2010, 3:27 am, edited 1 time in total. This nice D&M mitt changed hands on ebay recently and I really liked this double cloth patch model. D&M would partner up with different distributors and add patches from both companies, In this instance D&M and "Rochester Sporting Goods". Notice how much room the patches take up on this mitt. Pretty flamboyant but good advertising. In contrast to this, is my favorite double patch model, the early "Bill Doak" Rawlings model. I love the "Rawlings" Shield design. There is a lot of information presented here in these two patches in a very neat and tidy way, all presented between the rolled leather piping of the narrow wrist strap. Another multi-patch glove I love is the Ken-Wel "Dazzy Vance" model. This version here kind of takes the cake with a total of three cloth patches, "Leacock Sporting Goods", "Ken-Wel" and the "Dazzy Vance" patches. I like the way the "Dazzy Vance" patch is angled off to the side around the thumb. I hope other glovers will upload pictures of their favorite multi-patch gloves!